VoiceFinder AP-GS2500 is a new cutting edge Analog or IP to GSM gateway supporting maximum 16 ports of GSM Voice interface. 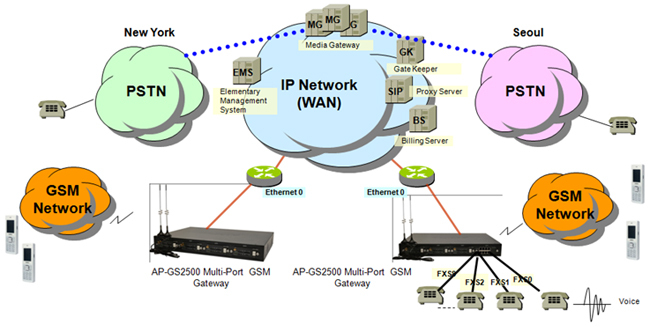 GSM and analog interface of AP-GS2500 provide an optimized call scenario when it interoperates with conventional PBX. Compact cost effective design and system architecture of AP-GS2500 provides customer satisfaction in high quality, performance and system reliance. This product uses the state-of-art technology voice compressed algorithm and unique QoS algorithm of AddPac to maintain the maximum voice quality under fast internet line and slow internet line as well. 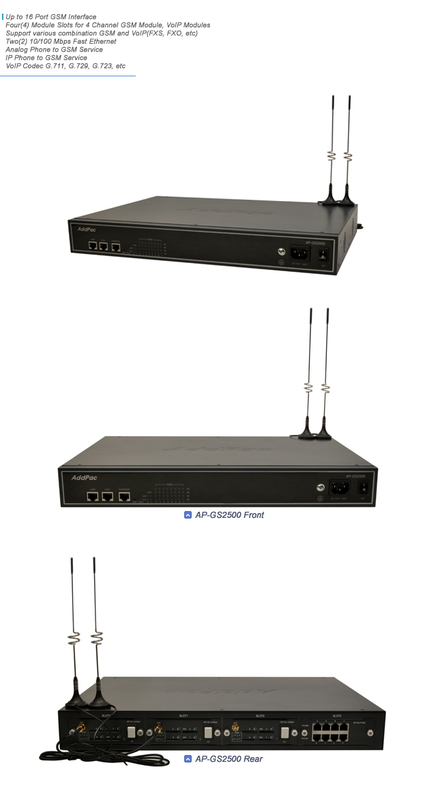 AddPac AP-GS2500 is a device that can support both GSM gateway service (FXS->GSM or Internet->GSM) and VoIP gateway service (FXS->Internet) simultaneously. It also supports SIP, H.323 Multiple VoIP signaling protocol, various voice codec support(G.711, G.726, G.729, G723.1), Four(4) module slots for GSM and VoIP module, two(2) fast ethernet ports, 1-port RS232C console, and state-of-art technologies and services. GSM gateway combining IP-PBX is now suggesting a new model for a main voice communication solution. In order to be a part of advanced VoIP communications naturally in the future, making an excellent choice of choosing GSM gateway is essential. VoiceFinder AP-GS2500 is a mid-range GSM gateway providing total 16 GSM interface ports or 12 GSM interface ports + 8 FXS interface ports. It is suitable for general enterprises, small and public offices. It has functions as a media gateway which interoperates with IP-PBX and it enables to replace small and mid size analog PBX. Especially AP-GS2500 provides an optimal solution of VoIP and GSM communications in telephony environments that using telephone lines and PBX to get connect with a head office. VoiceFinder AP-GS2500 GSM VoIP Gateway supports two(1) 10/100 Base-T fast Ethernet Interface ports and provides stabilized leased line environment, ADSL environment, cable modem environment, fixed IP Address, supports all flow IP environment so that it can be selected in accordance with user environments. Designed on programmable high performance RISC Integrated DSP Technology, AP-GS2500 is capable of adopting new capabilities and improvement by downloading firmware from website or with its auto-upgrade option as the customers' needs grow. Moreover, operators can download the latest protocol or service improvements as well as update firmware by checking the version and activating the auto-upgrade via AP-NMS (Network Management System) or AP-VPMS(VoIP Plug &Play Management System) system of AddPac Technologies. AP-GS2500 not only supports network access control but it also provides solid service level security. By CID (Caller ID Detection), you can identify the phone number of callers before answering and simply block it. AddPac technology is not just a vendor of GSM Gateway Box for the customer satisfaction, but it provides various products for appropriate network environment for VoIP, Media Gateway, audio/video terminals, audio/video MCU, IP audio/video broadcast, VoD solutions, network DVR solution, audio/video recording solutions, and traffic controller QoS device solutions. In the future, All IP based multimedia telephony environment, various audio/video resources should be shared on an IP Network; thus, the integration of solutions for each area and entire solutions are considered as top priority. AddPac IP telephony solution is designed to consider the integrated multimedia solution so that it can satisfy the various needs of customer. AddPac’s various GSM, VoIP Gateway series and multimedia network devices have been fully recognized in terms of its performances and stability throughout the world. AP-GS2500, with our accumulated experiences and know-how in the enterprise and service provider markets, will provide full satisfactions for customers who ask for a next-generation GSM-Gateway.